ALBUQUERQUE, N.M. — Sandia National Laboratories won four awards from the Federal Laboratory Consortium for work to develop and commercialize innovative technologies. The annual FLC awards program recognizes federal laboratories and their industry partners for outstanding technology transfer achievements. “New technologies and partnerships continue to emerge from Sandia, showcasing the labs’ talented workforce and our impact in national security, emergency response and scientific modeling,” said Jackie Kerby Moore, Sandia’s manager of Technology and Economic Development and the labs’ FLC representative. 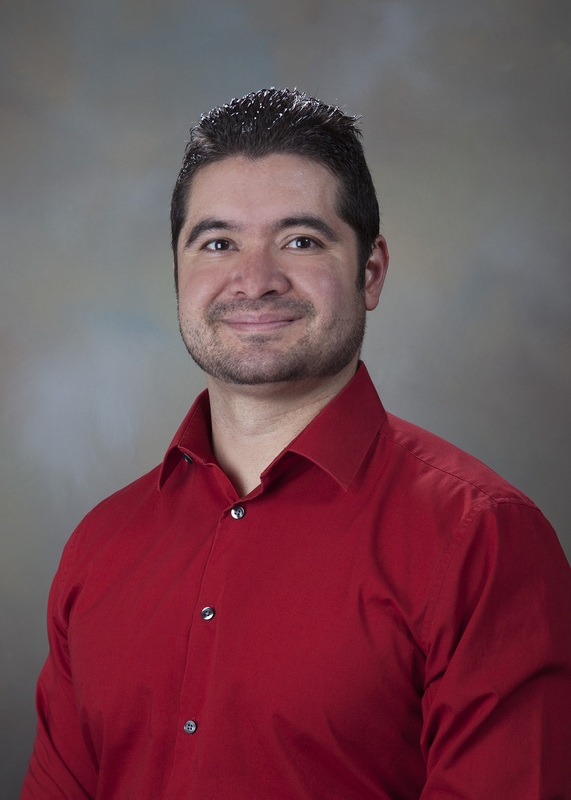 Business development specialist Jason Martinez for strengthening the labs’ Cooperative Research and Development Agreement strategy and significantly growing the CRADA portfolio three years in a row. Twenty-five-year partnership with The Goodyear Tire & Rubber Co. that has produced many successful projects and advances for the tire industry and the labs. Partnership on a software toolkit for emergency planners and first responders. Advances in the science of scintillators — objects that detect nuclear threats — through the development of organic glass. The FLC Awards are considered some of the most prestigious honors in technology transfer. Sandia winners were recognized at an awards ceremony Aug. 29 in Oklahoma City. Business development specialist Jason Martinez developed and implemented a strategy that strengthened Sandia National Laboratories’ CRADA portfolio. (Photo by Lonnie Anderson) Click on the thumbnail for a high-resolution image. Not long after he became a CRADA specialist at Sandia, Martinez developed and implemented the lab’s first CRADA strategy following a 36-year history of CRADAs. Martinez won a Technology Transfer Professional of the Year award for the strategy’s impact in the Mid-Continent Region. Martinez said soon after he started working at Sandia in 2013, he met 15 engineers at a poster session who worked on various new technologies, and none of them had heard of CRADAs. The strategy encourages proactive engagement with researchers and managers to better educate them about CRADAs. Martinez’s efforts with the CRADA strategy led to significant growth of Sandia’s CRADA portfolio. In 2017, 41 CRADAs were established between Sandia and private companies or universities as compared to about 20 per year prior to 2013. “What I really enjoy seeing now is the excitement and enthusiasm from engineers who want to work with other companies using the CRADA mechanism,” Martinez said. Sandia won a Mid-Continent Regional Partnership Award for past achievements and a continued partnership with Goodyear. The Labs and tire company signed a CRADA in 1993 when technology transfer from national labs was in its earliest stages. The collaboration, still strong today, allows Sandia to enhance software modeling capabilities while simultaneously addressing Goodyear’s challenges. Sandia National Laboratories computer scientists, from left to right, Vicki Porter, Byron Hanks, Antonio Recuero and Mohammed Sobhanie of The Goodyear Tire & Rubber Company study images of tire technology. (Photo by Jennifer Plante) Click on the thumbnail for a high-resolution image. The partners are currently working on several strategic projects. One supports virtual tire models to accurately predict tire performance before the tires are built. This strategic effort enables Goodyear to submit tire models to car manufactures early in the design cycle. Another active project involves modeling materials for tires to enable the best combination of material properties. Sandia also advanced simulating the flow of turbulent air around rotating wheels, enabling noise modeling of rotating tires. Ted Blacker, Sandia’s program manager for the Goodyear CRADA, explained why the partnership has been successful. Goodyear’s engineers design every tire with Sandia-developed tools, which are run thousands of times a day, Blacker said. Sandia, California Fire and Rescue Training Authority and the Sacramento Metropolitan Fire District collaborated to deploy SUMMIT, or the Standard Unified Modeling, Mapping and Integration Toolkit, for emergency planning and exercises. The software, initially developed through funding from the Department of Homeland Security, enables users to create scientific models and simulations to help improve emergency response protocol. This collaboration won a Far West Region Outstanding Partnership Award. The screenshot shows the SUMMIT tool during an exercise simulating a terrorist attack in which an improvised explosive device produced a hazardous plume. The software helped exercise participants calculate health impacts and medical surge requirements, and analyze evacuation routes and timing issues. (Image captured in the SUMMIT tool by Sandia National Laboratories researcher Lynn Yang) Click on the thumbnail for a high-resolution image. Emergency planners need to understand consequences of disaster and the impacts of response options for natural risks, such as earthquakes and wildfires, and man-made risks, such as improvised explosive devices. Emergency responders also require real-time and projected event details, such as infrastructure damage, possible numbers of casualties or displaced citizens. Other technologies used by the California authority track resources and maintain situational awareness of current activities, such as what the weather is doing, or where and how big a fire is. The modeling feature within SUMMIT enables users to forecast how natural and unnatural disasters could spread and shows what critical infrastructure would be affected. SUMMIT was used in an exercise called Decisions Matter that simulated a terrorist attack involving an improvised explosive device planted next to a chlorine tanker. The explosion caused a hazardous chlorine plume, and SUMMIT helped exercise participants, including hazardous materials first responders and public health officials, calculate population health impacts and medical surge requirements, as well as analyze evacuation routes and timing issues. It could soon be more difficult to smuggle nuclear materials through U.S. ports and borders using organic glass scintillators. The small, hand-held detectors engineered by a Sandia Labs team and California-based XIA, LLC, won the Far West Region Outstanding Technology Development Award. 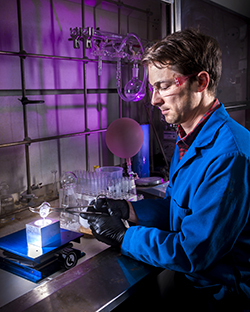 Sandia National Laboratories researcher Joey Carlson demonstrates the ease of casting an organic glass scintillator, which takes only a few minutes as compared to other scintillators, which can take several months. (Photo by Randy Wong) Click on the thumbnail for a high-resolution image. Sandia’s organic glass scintillator has been engineered for high detection efficiency of radioactive material without high production costs. Organic scintillators produce light in response to the presence of nuclear materials. Depending on the amount of light produced and the speed with which the light appears, the source can be identified. The simplicity and low cost of manufacturing could allow for widespread use. Currently, threat detection scintillators are either made from expensive materials or plastics that have limited ability and cause frequent false alarms. Due to its advantages over existing scintillator products, XIA is integrating Sandia’s organic glass scintillator into detectors for real-world applications. The partners have been working together since 2017. “I’m glad that we were able to meet our goal to make something higher performing and more affordable than the options that were out there, and we were able to use out-of-the-box thinking to get there,” said Joey Carlson, a Sandia materials scientist who works on the scintillators. The team is now researching the possibility of blending other materials with the organic glass scintillators to change its performance in detecting radiation. This could broaden applications even further.